This was the opening of an unusual ad. The candidates who took them up were given eight unusual writing assignments. Ten people passed and joined JWT’s 85 member creative team. Sorry, neither I, nor perhaps even JWT, have the winning submissions to this unusual series of exercises. Just reading the test will uncork your creativity bottle. Click on the thumbnail to open the PDF. The contact person on this ad is Jim Patterson. At the time he was the creative director at JWT but now he is James Patterson, best-selling author of Kiss the Girls, Along Came A Spider and other thrillers. No wonder I was drawn to those ad assignments. As you mentioned, Patterson is the author of Kiss the Spider, Along Came a Spider and Double Jeopardy, which were brought to the movie screen. The first two starred one of my all time favorite actors – Morgan Freeman – and the third film was directed by Bruce Beresford, who director Morgan Freeman in Driving Miss Daisy – one of my all time favorite films. LOVED the insanely curious email subject headline “Sell telephones to monks?” had to click on it. I spend hours a month trying to come up with headlines like that! Hi! I was the first writer hired as a result of the test! I had done improv comedy for five years prior so the test was a lot of fun for me. Now I am attempting to follow Mr. Patterson’s footsteps and am writing mysteries and thrillers! Thanks for taking the time to comment and actually connect us with this most interesting moment in advertising history. I find it fascinating that you had a stand-up comedy background because so many of our successful direct response copy colleagues have had door-to-door or at least face-to-face sales experience. Certainly, doing stand-up demands one can think on his feet, like all good writers are supposed to. God knows, it hurts a shade more being booed off stage than merely flubbing a sales pitch. Good luck following in the footsteps of your multi-talented mentor! Well, remember this was 1984. Computer modems were these cradles you had to jam a telephone handset into. Buy purchasing a phone and a modem, he would be connected to Monkmail a way to stay connected with Trappists all over the world. Did a follow-up post on this. I also was among the 10 people hired. If you’d like, I still have a copy of my submission–just let me know. I ended up hating advertising, and I went on to own a volleyball league, start a website, and now I’m back in school to become a teacher. Never saw that ad – I was by that time marketing director in a different field. In the sixties I was a copywriter in San Francisco for BBDO and later JWT – my heroes were William Bernbach, David Ogilvy, and Leo Burnett – it was a wonderful, crazy time – we flew first class – enjoyed hotel rooms with twin king-sized beds – and ate well – the highlight of my career was working for an Irish ad agency and doing a campaign for a Jewish resort in Southern California (From Mishmash to Hoo Hah in 90 minutes!). Also did freelance copywriting in Europe for 12 – 13 years. What a bunch of super sensitive, out-sized egos! You’d have thought our text was sacred! I’m 82 and in Pittsburgh of all places and I’d do it again. I’d do it right now, in fact. God bless. I too would love to see your submission , my mail-id is aakashsingh@gmail.com . And thanks to all for sharing the infromation . Its invaluable for ad industry aspirats like me. Just wish there was some sort of copy test in India . I entered this ad all those years ago while in college in Illinois and I came up with MONKNET as I recall and drew little pictures of modems. They didn’t offer me a job, though I did get a ‘thank you’ letter. I must thrown own the copy I had of my submission in one of my many moves I’ve made over the years. 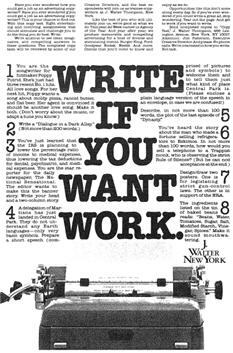 As I type this I’m currently working freelance as a copywriter at JWT in New York. Only took me a quarter century to get here! I was one of about twenty (or so I was told) who interviewed for the JWT jobs, based upon my submission (there were about 2000 entrants, as I recall). But I didn’t get hired; I was a lawyer, and I think they thought I wasn’t serious about jumping professions (little did they know!!). My sales pitch for the telephone to the monk involved putting the phone in his room, where a ringing telephone would provide a test of his ability to avoid answering it! P.S. I think the HR person at the time was “Mindy”; does anybody remember her? hi, Billy. i am a copy writer. and got fascinated by the trappist monk story. I’d love so much to get your submission. i also would be interested in seeing your entry regarding the monk and the telephone. please do send yours at whathaveyoureadtoday@gmail.com. thanks in advance! Hi , i am a management student and i have applied for internship in a few agencies in advertising. I want to try out for copy-writing. It would be of great help and hell lot of appreciated if i could have a look at your submission. Please help. Selling a telephone to a monk taking a vow of silence. That’s got to be some pretty sacrilegious copy.